What a tangled web Ivanka Trump weaves. Unless, of course, you don’t pay any attention to what she says and just watch what she actually does. Then her agenda becomes a whole lot clearer. Politico reported on Monday that Ivanka will soon by working out of an office in the White House, which she still claims she doesn’t work for. Ivanka has previously stated that, despite moving to D.C., she will not play any formal role in her father’s administration. Instead, she will informally wield a massive amount of political power. Ivanka’s attorney Jamie Gorelick told Politico on Monday that Ivanka will serve as her dad’s “eyes and ears,” and advise him on a broad range of issues, as had been previously speculated. Politico refers to Ivanka’s new standing within White House walls as, “a role that comes with no playbook,” and I’d go as far as to say it will be a role that comes with no accountability either. Though Ivanka is in the process of obtaining a security clearance and will receive government-issued communication devices this week, she will not be, “automatically subject to certain ethics rules,” according to Politico, because she doesn’t technically work there. Ivanka will not be given an official title, will reportedly not be receiving a salary, and, therefore, not be a government employee. Her lawyer says she fully intends to comply with all the ethics rules she’s not subject to though, so don’t worry. Apparently people close to Ivanka don’t think there’s anything strange about this, because she always works with her father, like on his reality TV show, The Apprentice. But ethics experts, like Norm Eisen, think it would be better if there were rules Ivanka had to follow. “The better thing to do would be to concede she is subject to the rules,” Eisen told Politico. Yes, and what more does Ivanka have to do to demonstrate that that’s never going to happen without being somehow forced? 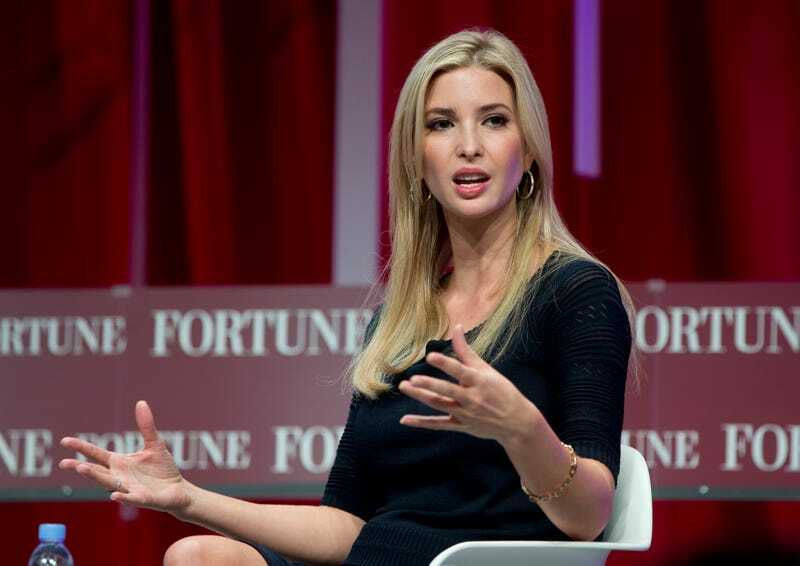 Though Ivanka and her husband Jared Kushner (an official presidential advisor) have sold as much as $36.7 million in assets to comply with ethics rules, according to Bloomberg, and Ivanka has divested her common stock, tech investments, and investment funds, she still owns her brand, presenting inevitable conflicts that she and her lawyer are, “trying to minimize.” In other words, she’s giving up her position at her company, her title, and gaining even more political access, with no strings attached.